Retail investors tend to fixate on current dividend income. CEFs may therefore overweight exposure to riskier stocks and bonds simply because they tend to have higher yields. For the same reason as above, CEFs may borrow money to buy investments to make their yields even higher. This will cause the fund to have higher beta (Greek-geek-speak that means the fund will go up more than the market when the market is up and down more when the market is down). Retail investors chase momentum: If it was up last year, they want it. If it was down last year, they don’t. This means that active managers of CEFs may overlook investing in cheaper, beaten-down assets, since those aren’t as appealing to retail investors. This also explains why CEF discounts tend to grow as a fund falls (as investors flee simply because there is downward momentum). While it is critical to do your homework before investing in a CEF, it is also true that there is a price for everything. Buying when something is massively on sale can make up for the fact that it has a few scratches and dents. In the world of CEFs, the fact that a fund is trading at a discount to NAV does not necessarily mean that it is a bargain — most funds trade at a discount! A fund isn’t truly in the bargain bin until it is not only trading at a discount, but trading way below its normal discount. A statistical tool called Z-score is an easy way to measure this. Z-Score: (Current Discount – Average Discount) ÷ Standard Deviation of Discount. Also referred to as a fund’s “relative discount” (discount relative to typical discount). A fund with a negative Z-score is trading at a discount that is below its normal discount. A fund with a positive Z-score is trading at a discount above its normal discount. A fund with a Z-score of 0 is trading right at its normal discount. Without diving too deep into statistics, a fund’s Z-score falls in a range of -2 to +2 about 95% of the time. If you assume that a fund’s discount will revert back to its average over time, you should avoid funds with high Z-scores in favor of funds with low Z-scores. Investors in CEFs receive a “tailwind” of sorts to their returns when the discounts of CEFs rise back up to their normal level and the market price increases relative to NAV. Investors buy CEFs (and other investments) expecting them to deliver positive returns in the form of dividends and price appreciation. Dividends and price appreciation are expected over time — expenses associated with owning an investment are guaranteed. Wall Street has a funny way of making sure it gets paid no matter what! Typically, the largest expense associated with owning a fund (be it a CEF, ETF, or mutual fund) is the management fee charged by the manager of the fund. Management fees are deducted from fund assets and transferred to the fund manager at regular intervals to compensate the manager for its work (regardless of fund performance). The fees paid to the manager have a direct, negative impact on investors’ returns since they reduce NAV. Actively managed funds generally carry higher fees than passive/index funds to cover the expenses associated with active management (since active managers hire teams of analysts and researchers to help them try to “beat the market”). Actively managed funds have higher turnover (they jockey between investments more often) than passive funds — this leads to higher transaction costs paid by the fund, as well as potential tax consequences from realized gains/losses for investors. You can usually find information on CEF expenses on the fund sponsor’s website or through one of the resources listed in the “Due Diligence Resources” section below. Given that CEFs are often marketed to retail investors who tend to fixate on investments that generate current income, paying attention to the quality and diversification of assets held by a CEF is important. If a CEF has a high dividend yield, it’s probably because it holds high-yielding assets. As a general rule of thumb, assets with higher yields carry higher risk (they have to pay bigger dividends or more interest to compensate investors for more risk). High yielding assets are not necessarily bad investments, but investors need to be aware of the risk they take on in owning them. In addition to investigating the risk of a CEF’s underlying holdings, you should try to determine if the fund holds a diverse basket of investments by examining a list of fund holdings. After all, one of the primary reasons to invest in a fund product is to achieve efficient diversification! Information about holdings (including average credit quality and duration of bond holdings) can be found on the fund sponsor’s website or through one of the resources listed in the “Due Diligence Resources” section below. Another thing to be on the lookout for is whether a CEF you are considering has a “managed distribution”. A fund without a managed distribution simply passes income the fund earns along to shareholders in the form of dividends/distributions. A fund with a managed distribution makes a commitment to shareholders to distribute either a fixed dividend/distribution or a dividend/distribution based on a formula. If the managed distribution policy of the fund calls for a dividend/distribution in excess of the fund’s income, the fund will sell off some assets and use the cash from the sale to satisfy the dividend/distribution payment. In other words, investors receive dividends/distributions that are only partially income — the rest is just return of capital. In this case, the fund literally cannibalizes itself in order to sustain payments to shareholders, and uninformed shareholders assume they are just receiving fat income distributions! A fund with a managed distribution is not to be avoided, necessarily — it’s just important to be aware of where dividends/distributions are actually coming from. Some CEFs borrow money to buy additional assets. This “leveraging” of the fund’s capital will cause the fund’s NAV to increase faster when the assets it holds appreciate. On the flip side, the NAV of the fund will drop faster when the assets it holds depreciate. Also, the more highly levered a fund is (the more it borrows), the more interest expense the fund must pay, which is a drag on returns. Leverage is a powerful tool that that can be desirable for CEF investors, especially when an investor is particularly bullish regarding a fund’s prospects. That being said, levered investments have made many grown men cry. For best results, take a CEF’s leverage into account when planning the size of your investment in the CEF. If you want $10,000 of exposure to U.S. real estate in your portfolio and fall in love with a CEF that holds U.S. REITs and is levered 1.2 to 1, consider trimming your investment size (perhaps to $10,000 ÷ 1.2 = $8,333). This can help your from getting more (or less) than what you bargained for. 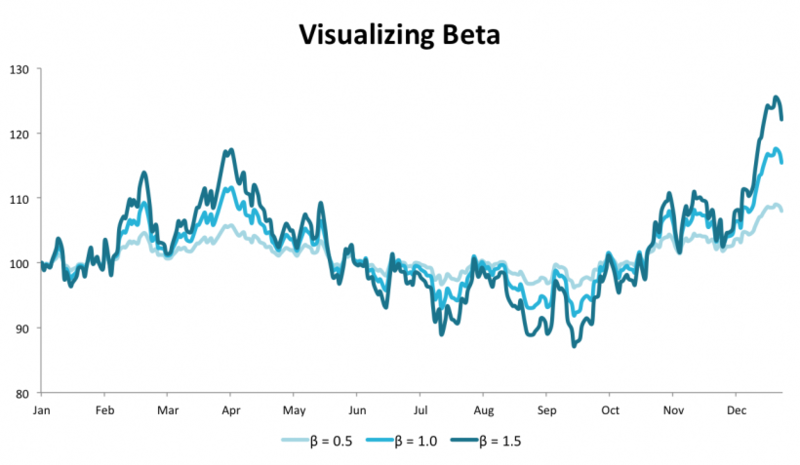 While information about a fund’s use of leverage can be found on the fund sponsor’s website and/or using the resources below, another tool can be used to measure the sensitivity of a fund’s NAV to changes in the prices of its holdings: beta. Beta is a statistic that is calculated using a series of returns of an investment (or its NAV) over a time period and a corresponding series of returns of some benchmark index or fund over the same time period. The beta statistic estimates how much a fund (or its NAV) will change in response to a change in the benchmark. If a CEF’s NAV has a beta of 1.5 with respect to the S&P 500 as the benchmark, you could use this information to predict that the fund’s CEF will move 1.5 times as much as the S&P 500 moves. For example, if the S&P 500 goes down by 0.50%, you would predict that the CEF’s NAV would go down by 0.75%. If the CEF you were analyzing held stocks similar to those in the S&P 500, you could use beta as a proxy or substitute for the fund’s leverage. You can calculate beta yourself or look for this statistic on the resources listed below. Note that the more similar the benchmark is to the fund you are analyzing, the more useful and accurate beta will be in predicting the sensitivity of your CEF to changes in the benchmark. It would not make sense to calculate the beta of a CEF that holds foreign government bonds using the S&P 500 as a benchmark, since foreign government bonds and large-cap U.S. stocks are very dissimilar assets. Morningstar.com – While some of the content available through Morningstar requires a subscription, plenty of useful information about specific CEFs is available free of charge. Find the CEF you are looking for by searching the fund’s ticker symbol. Closed-End Fund Association (CEFA) – Although CEFA represents the interests of closed-end fund sponsors, it is still a great resource for learning more about specific funds. CEF Connect – Although sponsored by a closed-end fund sponsor, CEF Connect offers one of the most powerful, free closed-end fund screeners on the web.